We immediately spotted that the word lengths didn’t correspond with the cells available, and were thus given the extent to which we were to remove letters or parts of words and the very first clue we solved, ‘Off key singer or grand instrument player (12)’ gave us ORGAN-GRINDER with an extra S and suggested that the company we had to liquidate might be a GANG, since we had room for only eight letters. That was the first moment of dismay, when we suspected that our solution was to be made up of ‘not real words’: ORRINDER indeed! Kruger had almost immediately (on the first clue read-through) confirmed his renewed membership in the Setters’ Oenophile.org with ‘Ran around kiln, intoxicated (7)’ which gave us BLED round OAST = BLASTED with an extra O (but we had that extra letter dilemma). He had TALENT ‘Attractive young girls almost cry without wine? On the contrary (6)’ (CAL[l] in TENT with an extra C) as winophile company too … Hmm Kruger! The dilemma was soon resolved: ‘Speak fondly about trees with new romantic author (7)’ gave us COO round O[A]KS + N, Catherine Cookson, but when I attempted to remove the C, the K clashed with LOTUS ‘Perhaps jujube beside lake is unusually stout (4)’ L + STOU[T], it began to look as though the S was the victim of the liquidation. Of course, a couple of generous clues soon confirmed that suspicion, ‘Unruly classes – ones without divisions throughout the year (6)’, was obviously SEASONLESS (with an extra C produced by the wordplay) and since our entry had to lose four letters, those were going to be SSSS. ASSESSED was the final hint we needed, so the gridfill, after about twenty minutes, was a logical teasing out of words from the letters that were slowly peopling it. I had to admire the ingenuity that had gone into making all these non-words intersect – quite a feat. We still had to suss out the quotation about SOCIETY, too and, of course, Margaret Thatcher’s words slowly revealed themselves, ‘There is no such thing as Society. There are individual men and women, and there are families’. I wonder how deeply she had thought about that statement before having it appear in Woman’s Own. She is a great source of quotations for compilers, isn’t she? Like A A Milne and Lewis Carroll. We slotted in our last two words TRENI[S]E and that unusual spelling of HAMP[S]TER and sent a silent vote of thanks to Kruger for a straightforward and relatively gentle solve. The other Numpty says each week, ‘All those solvers who claim a crossword is ‘not hard enough’ should be careful what they wish for – a real stinker must be on the books’. A long-time setter this month, although mainly in other places, this being only his third Listener. His last (no. 4265 Ability) had Dame Rebecca West’s quotation about journalism in the grid. Here, most clues had an extra wordplay letter that spelt out a quotation and its originator. 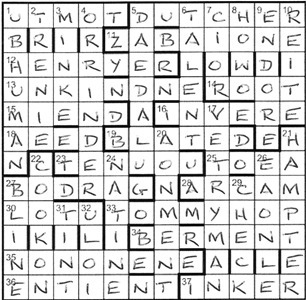 It didn’t take more than a nanosecond to see that most entry lengths were shorter than their clue lengths. Most were just one letter too short, but half a dozen were several letters too short, 34ac six. There were also five clues where lengths agreed. 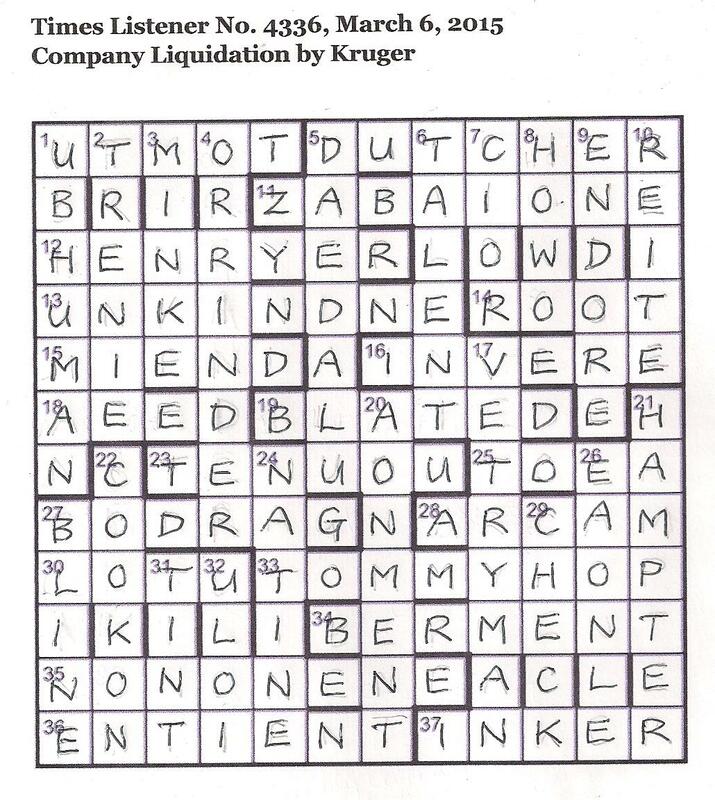 The clues were of Kruger’s usual tricky standard… by which I mean I didn’t solve them very quickly. I was lucky to decipher 11ac Baked mixture essentially sizzles with one habanero misused when recipe is lost (8), the letter Z and an anagram less H leading to ZABAIONE. Unfortunately, this was one of the entries which, presumably, didn’t need treating, so I was none the wiser yet. I decided to concentrate on the northeast corner, and 5 DAEDALUS needed to lose one letter. Then — and I was lucky this was so soon — 7 Pass, awful cross, is twice held (8) which was an anagram holding IS twice and SCISSORS looked as though it would need to lose all four letters S to give CIOR. 8 HOWSO and 9 ENDORSE could also be entered without their S, and I wondered what 13-letter word lost six of them for 34ac Confusedly, ambassador no longer with bearing enters between period of persistent attacks (13). Eventually, the quotation was revealed: There is no such thing as society from M Thatcher. Thanks to Kruger for a pretty tough workout… and a somewhat divisive theme, I suspect! The Listener Setters’ dinner tomorrow evening at The Old Swan in Harrogate, organised, as usual, by the setter Jago so I hope tonight’s crossword isn’t too demanding. Couldn’t do with a Sabre thrust tonight! We download it and what do we see? The Old Swan by Jago. We are Yorkshire folk (well Yorkshire/Scottish) and know all about the ten-day disappearance of Agatha Christie when there was a massive ‘manhunt’ since her abandoned car was found and foul play was suspected. 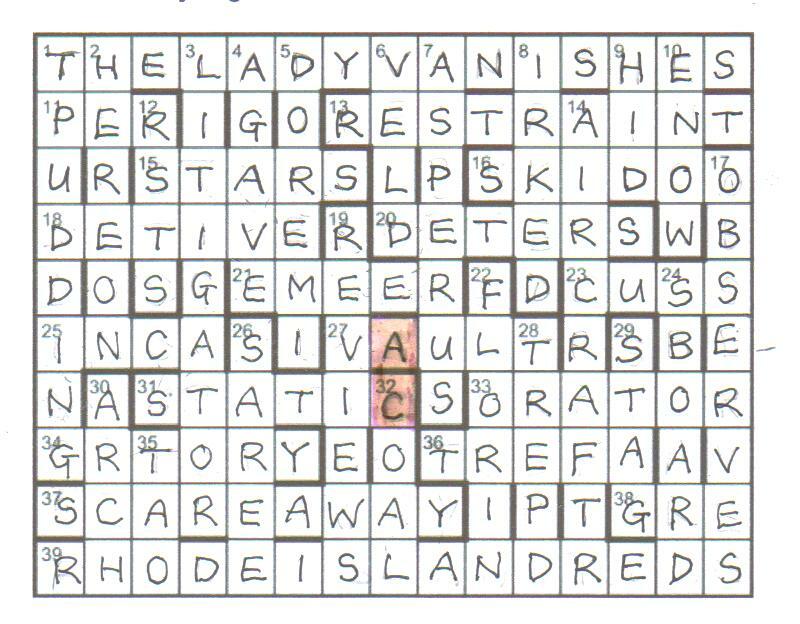 She made The Old Swan famous by being discovered there – so we suspected that we had the theme before we even started solving the crossword, but the film made about the episode was called Agatha and that wouldn’t fill those 15 cells on the top row of the grid. Just time to check that Jago still qualifies for the Listener Setters’ Oenophile club (no doubt he’ll demonstrate it by his fine choice of wine for tomorrow’s event). I have to read through lots of rather unsavoury foody clues ‘Such food is not allowed a bit of putrefaction (5)’ giving TREFA (hidden), and ‘Super duet in G & D – but the Queen not present – all about stodgy dessert (8, two words)’ an anagram giving SUET PUDDING from which we realize we have to extract SUE, since, while I am checking for the tipsy clues, the other Numpty has half filled the grid and found THE LADY VANISHES to fill his empty cells on row 1. Then I find the source of all that wine: ‘A very large vessel – which could perhaps hold your in-flight duty-free purchases? (9)’ Well, for all those thirsty setters keen to talk about their crosswords, they might need an AIRCRAFT CARRIER. Of course, we can extract CARRIE from that clue. And so it goes. A speedy fill as we tease out GRE[NADINE] from ‘in garden E’*(Eden’s first), GILL from another anagram that gave us ASPER[GILL]US, DE[CORA]TIVE, GR[ADA]TORY, R[EVE]STS, TREP[ANNE]D, S[KATE]BOARD and PER[SIAN]. We have ten vanishing ladies so all is well. A full grid and there is one task left to perform. We have to highlight the initials of the subject of the manhunt in two adjacent cells in a column. Agatha Christie – there she is, lurking, or hiding in The Old Swan in the central column. Thank you Jago! Hello again after a prolonged absence. I’ve been, shall we say, fairly busy, or distracted, or just buried up to my neck in the wonderful world of cruciverbal politics. Not a pleasant experience, but never mind. I have at least been keeping up with the Listener puzzles. 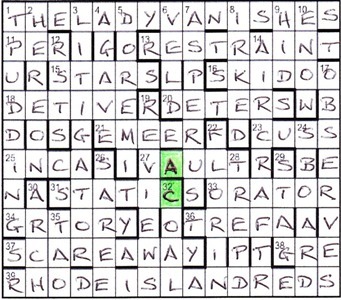 So far in 2015 we’ve had a run of reasonably doable puzzles, albeit with one or two pitfalls here and there (apparently Stick Insect’s blank grid tripped up more than a few! ), but at least that’s been balanced by a couple of puzzles marked generously. This week sees the first of the year’s numerical efforts, something I still look forward to as that’s where I started getting into Listeners. On the other hand, Brimstone’s offering arrived at the start of one of the busiest weeks I’ve had, and so in fact I only properly got a chance to look at it on the Friday a week after it came out. By chance, next week’s puzzle proved to be not too difficult, so it was possible to catch up quickly. I’d normally release a fully-worked solution but this time I don’t have one to offer as I solved this one essentially while half-asleep most of the time, and my method for solving the endgame was certainly not the most elegant solution! I ended up generating all 729 possible solutions to the first row that moved all single-digit cells apart from 1 and 9 (1, we were told, was fixed, and it became apparent that 9 had to stay still as well no matter what, along with the middle row), and then finding the handful of solutions that summed to 182 (= the middle row). Followed by checking what this made the third row sum to, and finding only one solution to that meant that the rest of the grid could be filled and voila! Somewhere along the way I must have deleted the “wrong” solution that doesn’t meet that “cells originally filled by 1-9 now sum to 200” condition, which is more luck than judgement, but there you go. To go back to the beginning, I picked up that F had to be 2 and V was 3, and then it was sort of steady-ish progress to find the rest, which makes it sound rather a lot more trivial than it actually was, but I suppose the point is that I wasn’t paying enough attention to work out the solving path. All I can say is that, despite the intimidating preamble, this was a fairly doable numerical puzzle even if you didn’t hit on the intended solution path, and hopefully most people found it that way. Now on the right side of a busier period, perhaps I’ll be able to keep up with the solving blogs more regularly, so until next time thanks, Brimstone, for marking the start of the numerical year with a fairly gentle ride.